Don’t you just love this time of year? Spring time and Easter! As much as we love it though, we do need to know what the Easter dangers for dogs are. Fortunately, there are experts who have kept statistics on the vet office visits that occur throughout the year so that pet owners can become more aware of the problems that can occur inside and outside a home. Here are some of the things that can harm or poison a dog during the Easter season. The spring season is the time for planting beautiful flowers, including the types that grow from bulbs. Unfortunately, many flower bulbs are toxic for pets. A pet can choke on a flower bulb, but the animal can also have a severe reaction to them. Remember that pets can dig in the gardens outside your home or in a neighborhood in addition to digging into a flowerpot that is on a table or a windowsill. Real eggs are a popular decorative item during the Easter season, but if an animal consumes raw eggs, then it can cause several health issues. Raw eggs can contain bacteria that will make a pet sick, but also, the raw egg white changes the animal’s digestive chemistry, leading to a deficiency of biotin. A biotin deficiency leads to skin problems such as excessive shedding of fur along with a chronic itchy sensation that makes an animal feel miserable. With hard boiled eggs, make sure you keep track of where you hide them during an Easter egg hunt and be sure to get the ones that weren’t found afterwards. After an egg has been sitting outside for a while and becomes rotten, it can cause intestinal distress in your pup if he eats it. Chocolate eggs are dangerous to dogs too. More about chocolate later. 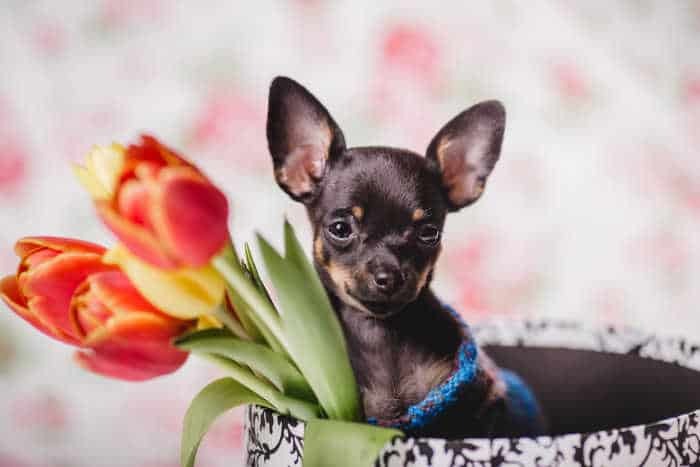 A Chihuahua may notice the plastic grass in a basket that is sitting on a table or shelf, and may climb or jump to reach it. If your dog swallows the strands of plastic grass, they can experience an obstruction in the stomach or intestines. This is an emergency problem that requires immediate surgery to remove the clump of plastic grass. During any holiday, we want to clean our homes completely, and that means that we buy and use additional cleaning supplies. It is never a good idea to leave any cleaning supplies in a location where a pet can reach the item. A dog is often attracted to the fragrance of the cleaning supplies, but ingesting the liquids or solids is dangerous. Cleaning supplies are considered a poison for children, but the items are also lethal for pets. Remember that pets will also lick items that are covered with scented cleansers, and the animals can also have a bad reaction. When we create baskets for children, we may include small toys or other small items, but these items could be dangerous. A pet can chew on these things, breaking the items apart, leading to a choking hazard. In some cases, the plastic or metal from these toys is also toxic because it contains a poisonous chemical. Ham is not a recommended food for pets because it is high in sodium and fat, leading to a digestive problem. Many dogs become nauseated from ham. The high salt content can also lead to pancreatitis. However, the strong odor from baking ham is tantalizing for a pet, so a pet parent must remain vigilant to keep their dog from ingesting it. Pet parents must make sure that guests don’t give bites of ham to the dog too. And make sure that a pet doesn’t dig through the trash to find the bones from the ham because it is also a choking hazard. Jelly beans are a favorite candy during this holiday season, but the sugar and dyes in this food can lead to health problems for a dog. 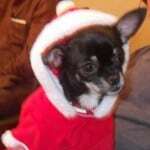 Pets can have problems digesting this sugar-filled candy, leading to vomiting or constipation. In addition, a Chihuahua has a tiny throat, and these sticky candies can create an obstruction in the throat that causes choking, or alternatively, the candies can enter the windpipe, leading to respiratory difficulties. While cooking eggs, don’t leave the eggshells where a dog can get to them. This may seem like a tasty treat for a dog, but we know that eggshells can cause problems for pets. In addition to being a choking danger, the sharp eggshells can cut a dog’s mouth or throat along with ripping holes in a pet’s stomach or intestinal tract. Homeowners who are planting a garden may have an assortment of fertilizers and pesticides for the soil and plants. 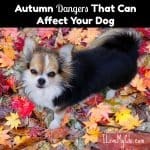 While having a pet playing nearby may seem fun while you are working on flower beds or a garden, your dog can ingest a poison in only a few seconds, and some of the chemicals in gardening supplies will kill a pet in only a few minutes. Cocoa shell mulch is something else to keep away from pets. It’s highly toxic to them. One of the most common dangers for our pets during Easter is the additional traffic from visiting friends and family. 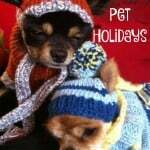 Pet owners may need to keep their pup in a carrier, playpen or attached to a leash to keep her safe, It is also important to remember that guests will open and close a home’s door repeatedly, and a pet may run away into the street outside where it could be hit by a car. 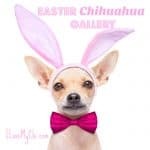 Some breeds of dogs can see bright colors, and while children are dyeing eggs, parents must make sure that pets don’t try to lick from a bowl of water that contains any dyes. 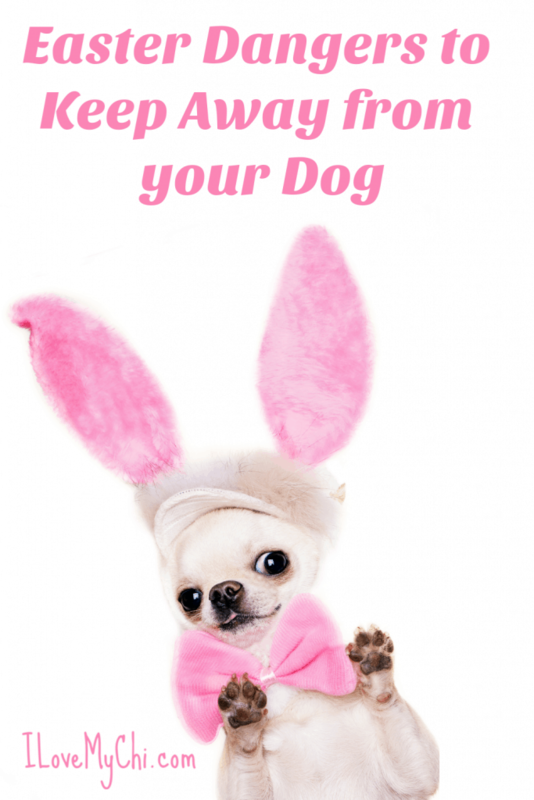 Keep the containers of dyes along with the items used for dyeing eggs away from all of the pets in a home. When a pet ingests chocolate, take the animal to a veterinarian’s office right away. 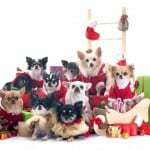 It is easier to keep our pets safe from the dangers of decorations and foods during the holidays rather than coping with an emergency. However, a pet owner should prepare ahead of time by having your veterinarian’s telephone number ready on your smartphone along with the address of a nearby animal hospital. 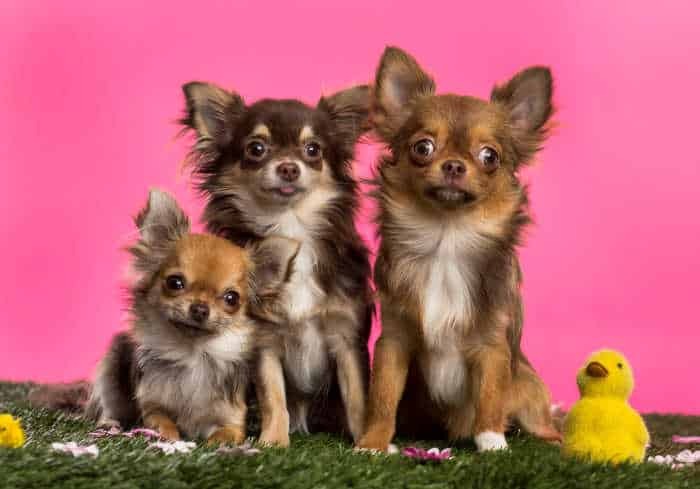 Now for some lighter fare, check out some cute Easter chihuahuas in our Easter Chihuahua Gallery. 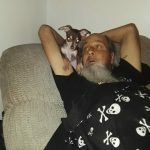 We rescued our Chi, Taco Bill, last year. We were told he was one at that time. He came with no history or instructions. He loves Taylor Pork Roll which we only give him as a treat or reward. Is this a no-no? He is pretty finicky about what he does and doesn’t like and have bought many things that he turns his nose up at and will not eat, so when we saw he liked this thought a little wouldn’t be harmful. However, we don’t want to give him anything that is harmful. He’s so cute! I’m not familiar with Taylor Pork Roll. Is it like a sausage? Is it salty like ham?